"Many of these children haven't had a lot of experiences in the outdoors," says Scott Smith, a lifelong gardener who doubles as a math and science teacher and garden coordinator at Holiday Heights, a Title I school serving about 700 students from pre-K to fifth grade. "When they go to the garden, they are fully engaged." That engagement is no accident. The Holiday Heights garden -- complete with tree house, raised beds, and fish pond -- is one of about 100 developed in partnership with REAL School Gardens.The nonprofit organization, with offices in Texas and Washington, DC, promotes "learning gardens" to boost academic success of low-income children. As part of the model that it has spent a decade cultivating, REAL School Gardens also provides long-term professional development for teachers. As the school garden movement continues to grow, it's worth taking a closer look at the strategies that are yielding positive results. Smith didn't need to be sold on using the garden for teaching about science and math. In fact, the garden, installed in 2011, may have kept him from leaving education. "I was getting burned out," says the 17-year teaching veteran. Having a learning garden few steps from the classroom "has been a godsend," he says, renewing his passion for teaching and igniting his creativity to design engaging lessons. Smith realizes that not all of his colleagues share his enthusiasm for the kind of learning that can get dirt under the fingernails and mud on the shoes. "If there's one thing that will kill a school garden," he cautions, "it's not having teacher participation." Two strategies have helped Holiday Heights build teacher buy-in: ongoing professional development provided by a REAL education specialist, and day-to-day "cheerleading" provided by Smith in the role of garden coordinator. "That ongoing support is one of the most helpful things that REAL School Gardens does," says Smith. Several times during the school year, a garden educator spends a day on site, modeling lessons in the outdoor classroom. "We get a burst of enthusiasm," he says, "and sometimes it sticks." Teachers track garden activities on a clipboard, capturing data about how and when they use the outdoor space for learning -- from science or art projects to read-alouds or nature writing. When it comes to lesson planning, Smith suggests thinking about opportunities for close observation and hands-on learning. What better way to teach fourth-graders about the water cycle, for instance, than to take them outside and let them watch it happen. "You could show them in a book or have them draw the water cycle," he says. Instead, he recently taught about transpiration by having students put plastic bags over plants and then check back later to measure condensation. "Until that see that magic happen, 'transpiration' is just another big word with -ation on the end of it," he says. In math, he's constantly asking himself, "How can I teach this lesson in the garden? We could draw a rectangular prism on the board and talk about finding the volume of it, or we could go outside and figure out how many cubic yards of soil it takes to fill one of our raised beds, which happens to be a rectangular prism. That's a real thing to my students." Admittedly, some teachers worry about management issues outdoors. Smith advises them to simply treat the garden as an extension of the classroom. "My kids know I won't tolerate any nonsense. We stay focused on the learning goals," he adds, while at the same time enjoying the fresh air and chance to move around. A student named Julia sums up the benefits when she says that, before the garden was installed at her school, "I felt like a chicken stuck in a chicken coop all day long. That's why I was so excited when my teacher told my class we were getting a garden." Having access to the outdoor classroom "has definitely changed my outlook on learning, specifically science." How can schools sustain their garden programs for the long term? Build buy-in: Students, parents, teachers, and other community members had a hand in designing the Holiday Heights garden, building buy-in from the start. A design charrette generated kid-friendly ideas like the tree house. Teachers were specific about their learning goals for the outdoor space. With the design in hand, REAL School Gardens helped to coordinate a "big dig" day, when most of the construction took place with the help of community volunteers. Build buy-in by engaging your whole school community during the planning process. Agree on clear goals for what you hope to accomplish with the garden. Be ready to problem solve: Growing a successful school garden takes patience and, sometimes, a little problem solving. A combination of clay soil and heavy rainfall added up to inhospitable growing conditions during the first year of the Holiday Heights garden. "The only thing we could have grown that year was rice," says Smith. That led to a design modification, with raised beds built over the summer. "You have to be ready to think through problems and try new things," Smith says. "That's good for kids to see." Find a cheerleader: Recruiting someone for the garden coordinator role is another key strategy to sustain school gardens. Smith is looking for a replacement to take over when he retires. "You can't let a garden lie fallow," he says, "or it turns into a weed patch." 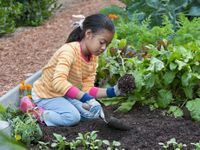 Celebrate success: Although REAL School Gardens is deliberate about measuring achievement gains and other important outcomes, some successes are harder to quantify-but still worth celebrating. At Holiday Heights, for instance, families often use the garden to relax on weekends. "I've gotten to know more parents through the garden than anywhere," Smith says. Some students consider the school garden their favorite place to spend recess. "They'll see me out there and start asking questions, offering to help. They'd rather do that than play on the monkey bars. It's just a nice place to be." Does your school have a learning garden? How do you use it? Please share your experiences in the comments section below.